HEAVILY DISCOUNTED LIVE ONLINE COMBINED GROUP USMLE STEP 2CK/STEP 3 REVIEW COURSE/PROGRAM. PLEASE CALL 8034935573 TO ENROLL. NOW YOU CAN GET THE BEST OF LIVE ONE-ON-ONE REVIEW SESSIONS AND GET READY FOR BOTH USMLE STEP 2 CK and USMLE STEP 3 With a SINGLE REVIEW COURSE/PROGRAM and SAVE BIG! Enroll Today by Calling BEST USMLE TUTOR at 803-493-5573! 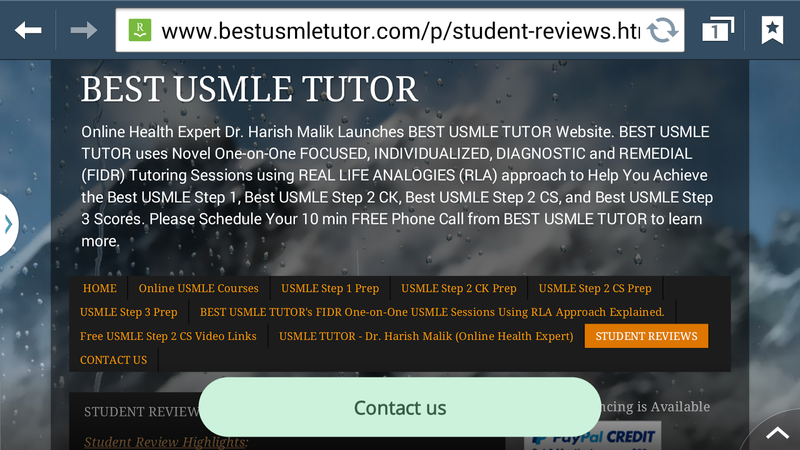 FOLLOW US ON TWITTER and RETWEET our TWEETS to LET ALL Your FRIENDS Preparing for their USMLE Step 2CK/Step 3 Know about our Latest Live Online Combined USMLE Step 2CK/Step 3 Review Sessions so that All of YOU can TAKE ADVANTAGE of the RIDICULOUSLY LOW PRICED LIVE ONLINE COMBINED USMLE STEP 2CK/STEP 3 SESSIONS by BEST USMLE TUTOR. Get Ready to REVIEW THE MOST HIGH YIELD USMLE Step 2CK/Step 3 MATERIAL. Learn about the Best USMLE Step 2 CK/Step 3 Resources and MCQ and Web-links for updated information and Most High Yield Topics for Step 2 CK/Step 3. Learn what to focus on while going over Review Materials for Step 2CK/Step 3. Make Learning Medicine Easy and Fun by using BEST USMLE TUTOR's RLA (Real Life Analogies) Approach to Medicine. Learn how you can use the BEST USMLE TUTOR's BUYING and SELLING Strategy along with ++++ and ---- Approach to Answering Step 3 Questions and Develop the Much Needed Critical Thinking Skills to ACE USMLE Step 2CK/Step 3. Make CCS Simple by preparing for it along with the MCQs. Call us at 8034935573 today for Pricing! All payments are via PayPal and PayPal accepts various forms of Payment and a PayPal Account is not Necessary! PayPal Credit is also available for those who qualify with Zero Interest for 6 months. Please Apply for PayPal Credit HERE! Please Call/Text/Email us YOUR DETAILS (Full Name, Email, Phone Number, and Location) at (803) 493-5573. Fill out the Contact Us Form and we will call you back as soon as possible!